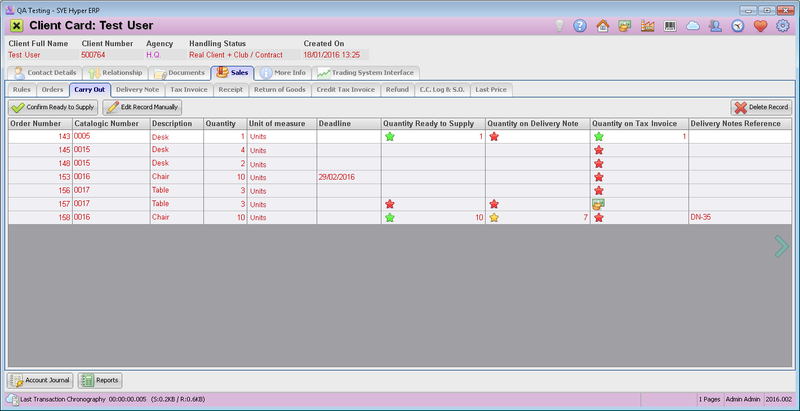 This tab is used to follow up and control the orders with a status of "Sent to Production". After production, the products status can be modified to "Ready to Supply", which allows to proceed with the delivery process and to produce delivery notes and invoices. - Not ready / Not delivered. - The whole quantity is ready / Delivered. - Some of the quantity is ready / delivered. The partial quantity will be displayed next to this sign. The system allows to modify the records of this table and update the following fields: Quantity Ready to Supply, Quantity on Delivery Note, Quantity on Tax Invoice. The action buttons at the top of the table are used to update and modify the quantities of the records. Any order which is ready to supply, and has a delivery note and tax invoice for its entire quantity, will be automatically removed from this table. Mark the chosen record as ready to supply (the whole quantity). This button is available only for orders that are not ready to supply or are partially ready to supply. Alternatively, the user can confirm the whole quantity as ready by pressing the red / yellow star. In order to confirm a partial quantity, use the "Edit Record Manually" button. Quantity - the quantity of products in this order. Deadline - the deadline to supply the order. Quantity Ready to Supply - the quantity of products which is ready to be supplied. Quantity on Delivery Note - the quantity of products in this order's produced delivery note. Quantity on Tax Invoice - the quantity of products in this order's produced tax invoice. Delivery Notes Reference - This field displays the delivery notes numbers (DN) as well as the tax invoices numbers (TI) related to this record. Delete the chosen record from the table. This action does not delete the order or any of its documents. Remove_Duplicated_Items_From_Client_Open_Billing_Or_Supply - Searches for a duplicate record in the hyp_Client Open Billing or Supply table, and remove it. Restore_Delivery_Notes_Logic_vs_Open_Billing_Or_Supply_and_Stock_Entries - Recover information according to delivery notes that were produced at the previous day and have a missing "Inventory Entries" or a missing quantity update in the supply records. Also, the system fixes the quantities in this table if delivery note was Canceled.